A four-wicket haul from Eddie Morrison paved the way for Castleford to win their first game of the season in the Yorkshire Premier League North. In a low scoring contest with Woodhouse Grange the bowlers of both teams were on top, but it was Castleford who ran out winners by a two-wicket margin. They put Woodhouse in to bat first and the hosts initially made a solid start before the wickets started to tumble. Michael Hattee (18), Chris Bilton (12) and Mike Burdett (15) helped them reach 60-2, but the fall of the latter to Connor Hyde sparked a collapse that saw the last eight wickets go down for 73 runs to leave Woodhouse all out for 133. Morrison was the pick of the Cas bowlers with 4-37 from 11 overs while Tom O’Connor took two early wickets, there were two for David Wainwright and one each for Daniel Robson and Connor Hyde. Castleford looked comfortable in their reply as they reached 77-2 with opener Liam Hyde hitting 27, Connor Hyde 27 and Wainwright 21. But they then lost wickets and were reduced to 108-6 then 130-8 before getting home in the 50th over. Robson hit a valuable 15 and Morrison 10 not out. Castleford were without skipper Wainwright for Sunday’s Hunters T20 Blast group A game and lost by 15 runs to Dunnington. Chasing their opponents’ 147 total, Cas could only make 132-7 in their 20 overs with Robson (25), Eddy Cole (23) and Byron Grant (19) top scoring. Connor Hyde (2-28) had earlier been their most successful bowler. Despite an outstanding knock from Eddy Cole, Castleford seconds went down by five wickets to Copmanthorpe in the Hunters York Senior League Ebor Division Three. 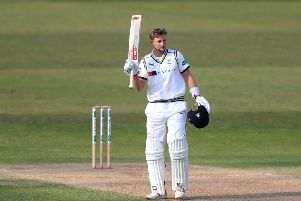 Cole made more than half of Cas’s runs as he hit a superb unbeaten 104. Opener Nigel Ling (37) gave him support, but no-one else could reach double figures as Castleford were kept to 177-9 off their 45 overs. Copmanthorpe knocked the runs off with seven balls to spare with all five bowlers used – George Gibson, Charlie Sykes, Cole, Robert Slater and Darren Tomlinson – taking a wicket each.